This website celebrates the memory of old and occasionally forgotten shows. The virtue of many of these old favorites is, they have moments that are memorable enough to remind us of terrific characters, situations, and events. Of course, we all have our own lives, and we all have those people, places, and things that will create similar moments… they just aren’t on TV every week for us to regularly enjoy. Hopefully, those terrific and memorable things are happening to us right now, or in the next week, or in the next month. But in 2008, along came a show that celebrated those moments each of us has lived along the way, and even gave out cold, hard cash… if only you knew yourself well enough, and could remember your own life! 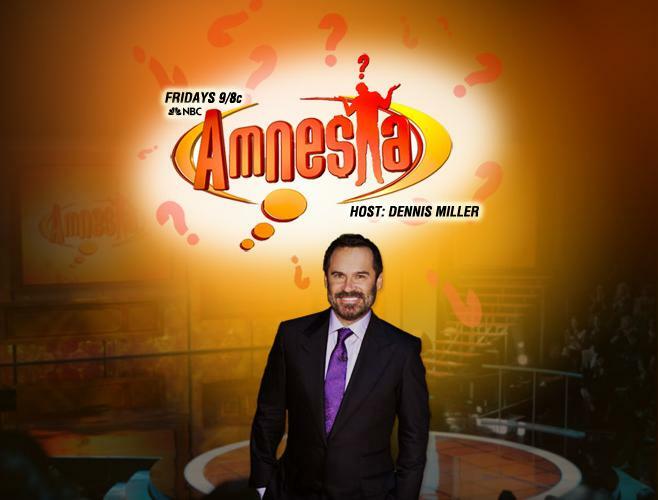 Amnesia (spelled with a dollar sign, as in Amne$ia, for promotional purposes) aired Friday nights on NBC. Hosted by comedian Dennis Miller, each week featured one contestant and the people in their life. Amnesia wasn’t a brain-burning trivia fest like Who Wants to Be a Millionaire?, or a pure lucky guess game like Deal or No Deal. It was a game of honest questions, where no one was more qualified to get the right answers than the contestant… because all of the questions were about them. Before each show, contestants were interviewed by the producers about their lives, their pasts, and their friends. An entire game show was created around these memories, skewed just enough to make it difficult for the contestant and yet interesting for the viewer. For example, one gentleman talked about his high school football exploits… so the producers found an old program from his playing days and asked him a simple enough question: What was your jersey number the year you led the team to the championship? The details of certain games, even certain plays, were likely ingrained over and over in his mind and reinforced with the telling of old tales… but what number was he? Others may have known, but memories may or may not have included looking down at his chest. By the way, the contestant got that one right… but many in the same situation may not have, and that was the fun of Amnesia. You never knew what people would remember and what they wouldn’t. Audiences could easily play along, reminded of youthful memories or various items of their own lives, some remembered and some not. Get it right, or else! 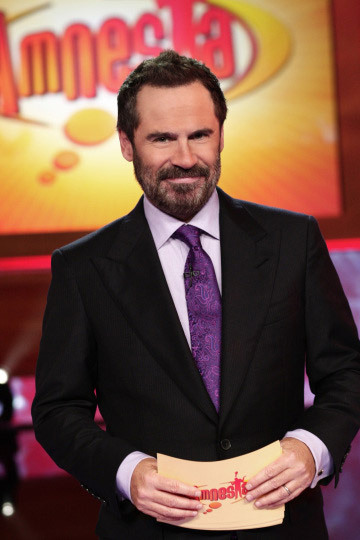 Host Dennis Miller was an unusual pick for this gig, as the only previous game show hosting he’d done was a show called Grand Slam, a pure trivia fest where he was literally the series host, and not the one asking the questions. On Grand Slam he was called on for a bit more snark and punditry, styles he was known for as a comedian. On Amnesia, he was a more genteel performer, cheering or agonizing along with the contestants. His occasional bombast was toned down, primarily because of his emotional connection with many of those playing. Every week, Miller would introduce each contestant, and a brief interview on camera would follow. The first round of the game, “You in Sixty Seconds”, asked a series of questions about basic personal life, such as “Which Beatles song was the theme for your prom?” or “”Where were you when you asked your wife to marry you?”. 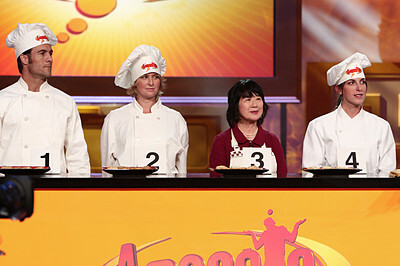 This established a “memory bank”, a small fund of money that each contestant hoped to increase throughout the game, but might have to risk at the end. In the next three rounds, Miller would send the player “off to their room”, a soundproof booth in view of the audience where they couldn’t hear what was taking place onstage. Then he’d introduce someone from that person’s life, often a spouse or other family member, for another brief interview that set up a series of questions. The contestant was then returned to the stage, ready to win money, but only if they knew the answers to some rather unique queries…. One contestant raved about his mom’s Shepherd’s Pie… so, after we met his mother, he was blindfolded, and out came three chefs… and his mother, each with a plate of Shepherd’s Pie for him to try. Could you identify your favorite dish alongside other similar ones? Of course, the questions weren’t always about childhood memories or days gone by. Sometimes they were about cars going by…. A local police chief in a small town received what should be a rather simple question: What was the posted speed limit on the road that went by the front of his own house? Guess what? The police chief missed it, saying 35 mph instead of 25 mph. I wonder how fast people were going by his place after that…. Some stunts were more physical. A man’s stuffed toy, precious to him as a child, was placed inside a toybox with numerous other similarly stuffed animals, and he had only thirty seconds to sort through and find his old friend. Another time, a man had decided (with friends) to hire an airplane to drag a banner across the sky… but does he remember the exact phrasing used on the banner in question? A large board was brought out, and parts of phrases, all similar, were placed in front of the man, and he had to recreate the banner. In each round, the money values escalated, with $75,000 earned at this point if no questions had been missed. But the big money was yet to come, as was bigger risk. The final round had three questions, each relating to one of the friends or relatives introduced previously. The first question was worth $25K, then $50K, and finally $100K, and players could choose which person’s question they wanted first… but they’d also lose that amount of money if they answered incorrectly. A contestant could continue as long as their “memory bank” still had cash left… but they could lose it all, and go home with nothing but memories. They could also walk away at any time after the first question, if they so chose, so their previous success (or failure) at the game played a significant part in their confidence moving forward. Big money was available… and all you had to do was know yourself. How well could you do with memories like this? Or knowledge about the world around you that you take for granted every day? And how well would you do with a possible $300,000 on the line? This was the challenge of Amnesia, and yet it was a game as different every time as each individual person was. The contestants and their loved ones really made the show, and there truly was an element of This is Your Life to Amnesia. While some of the supporters were obvious choices, the joy of being able to see that long-lost college buddy, or catching up with your sophomore homeroom teacher for the first time in forever, added a feel-good element to the show. Not to mention the prizes at stake, of course. Unfortunately, while long-forgotten friends and relatives showed up for the contestants, audiences didn’t. Anyone tuning in for Miller found a toned-down, more sedate version of the comedian, and while the show was interesting, it was far from provocative. Miller and company weren’t out to embarrass anyone, they just wanted to celebrate the lives of ordinary people and share them with everyone. That, they definitely did, and although the show was called Amnesia, it would be difficult for those who saw it to forget how much fun Miller and company had doing it. Although it’s no longer accessible from the main network site, the NBC show site for Amnesia is still available (thankfully, or this article would only have maybe two or three pictures, all of Miller). Game shows don’t traditionally have a lot of publicity photos available anyway, except perhaps generic shots of the host and the set. While many have a version of the game available online, Amnesia really can’t, due to the personalized nature of the questions. …which is a shame, as Amnesia is actually a show worth remembering here, about extraordinary moments in ordinary people’s lives. Not dramatic moments, but the individual memories that stay lodged in the mind and heart forever. Aired Friday @ 8/7 Central? Mostly. The premiere was actually 9/8 Central, but the seven other episodes did air in the Friday 8/7 Central timeslot. No wonder people forgot to watch.